Each transition to storing more bits per memory cell comes with significant downsides that offset the appeal of higher storage density. The four bits per cell storage mode of QLC requires discriminating between 16 voltage levels in a flash memory cell. The process of reading and writing with adequate precision is unavoidably slower than accessing NAND flash that stores fewer bits per cell. The error rates are higher, so QLC-capable SSD controllers need very robust error correction capabilities. Data retention and write endurance are reduced. But QLC NAND is entering a market where TLC NAND can provide more performance and endurance than most consumers really need. QLC NAND doesn't introduce any fundamentally new problems, it just is afflicted more severely with the challenges that have already been overcome by TLC NAND. The same strategies that are in widespread use to mitigate the downsides of TLC NAND are also usable for QLC NAND, but QLC will always be the cheaper lower-quality alternative to TLC NAND. 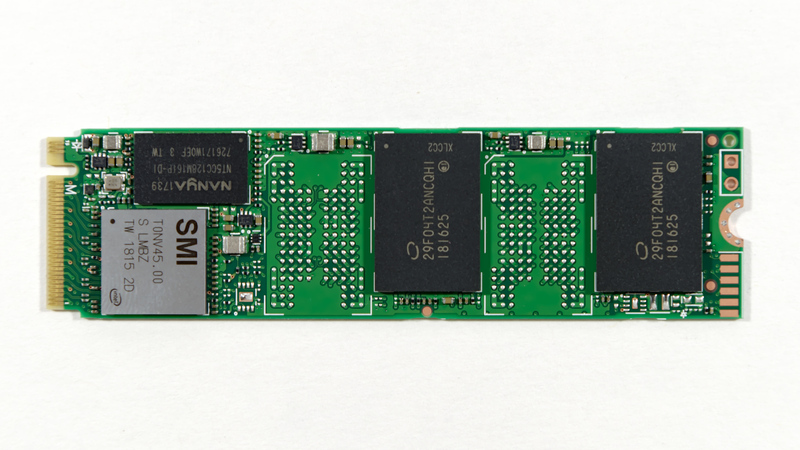 On the commercial product front, Micron introduced an enterprise SATA SSD with QLC NAND this spring, and everyone else is working on QLC NAND as well. But for consumers, where the pricing advantages of QLC are going to be the most noticed, it is Intel who the first to market with a consumer SSD that uses QLC NAND flash memory. Today the company is taking the wraps off of their new Intel SSD 660p, an entry-level M.2 NVMe SSD with up to 2TB of QLC NAND. Intel has reportedly cut off further development of consumer SATA drives, so naturally their first consumer QLC SSD is a member of their 6-series, the lowest tier of NVMe SSDs. The 660p comes as a replacement for the Intel SSD 600p, Intel's first M.2 NVMe SSD and one of the first consumer NVMe drives that aimed to be cheaper and slower than the premium high-end NVMe SSDs, through the use of TLC NAND at a time when NVMe SSDs were still primarily using MLC NAND. The purpose of the Intel 660p is to push prices down even further while still providing better performance than SATA SSDs or the 600p. Looking under the hood, Intel's partnership with Silicon Motion for client and consumer SSDs continues with the use of the SM2263 NVMe SSD controller for the 660p. This is the smaller 4-channel sibling to the SM2262 and SM2262EN controllers that are doing very well in the more high-end parts of the SSD market. A 4-channel controller makes sense for a QLC drive, because the large 1Tb (128GB) per-die capacity of Intel's 64-layer 3D QLC NAND means it only takes a few chips to reach mainstream drive capacities. The 660p lineup starts at 512GB (four QLC dies) and scales up to 2TB. All three capacities are single-sided M.2 2280 cards with a constant 256MB of DRAM. Mainstream SSDs typically use 1 GB of DRAM per 1TB of flash, so the 660p is rather short on DRAM even at the 512GB capacity. As a cost-oriented SSD it might make sense to use the DRAMless SM2263XT controller and the NVMe Host Memory Buffer feature, but that significantly complicates firmware development and error handling. The small size of the SM2263 controller allows Intel to fit all four NAND packages used by the 2TB model on one side of the PCB. Intel doesn't break down performance specs for the 660p by drive capacity, and the read and write performance ratings are the same, thanks to the acceleration of SLC write caching. Intel doesn't provide any official spec for write performance after the SLC cache is filled, but we've measured about 100 MB/s on our 1TB sample. This steady-state sequential write speed will vary with drive capacity. Intel is offering a 5 year warranty on the drive and write endurance is about 0.1 drive writes per day, lower than the 0.3 DWPD typical of mainstream consumer SSDs, but something that should still adequate for most users. Probably the most important aspect of a consumer QLC drive design is the behavior of the SLC cache. Consumer TLC drives universally treat a portion of their NAND flash memory as pseudo-SLC, using that higher-performing memory segment as a write cache. QLC SSDs are even more reliant on SLC caching because the performance of raw QLC NAND is even lower than that of TLC. 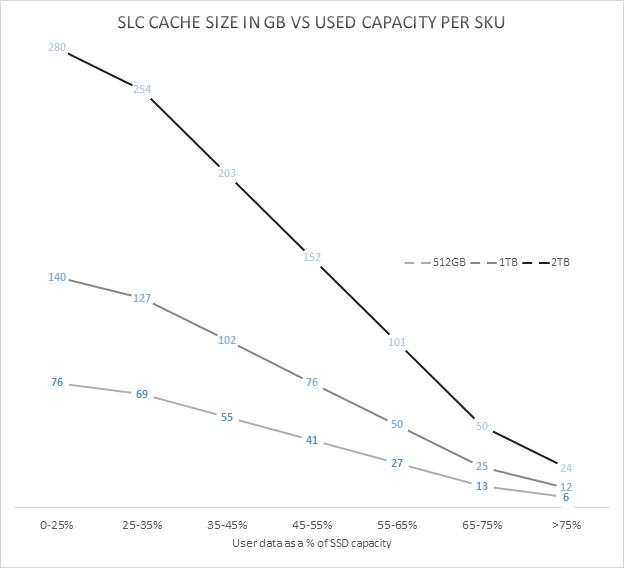 No SLC caching strategy can perfectly accelerate every workload and use case, and there are significant tradeoffs between different strategies. The Intel SSD 660p employs a variable-size SLC cache, and all data written goes first to the SLC cache before being compacted and folded into QLC blocks. This means that the steady-state 100MB/s sequential write speed we've measured is significantly below what the drive could deliver if the writes went directly to the QLC without the extra SLC to QLC copying step getting in the way. When the drive is mostly empty, up to about half of the available flash memory cells will be treated as SLC NAND. As the drive fills up, blocks will be converted to QLC usage, shrinking the size of the cache and making it more likely that a real-world use case could write enough to fill that cache. Our current test suite cannot fully capture the dynamics of a variable-size SLC cache, and we haven't had the 660p in hand long enough to thoroughly test it at various states of fill. When the Intel SSD 660p is mostly empty and the SLC cache size is huge, many of our standard benchmarks end up testing primarily the performance of the SLC cache — and for reads in addition to writes, because in these conditions the 660p isn't very aggressive about moving data from SLC blocks to QLC. As a result, our synthetic benchmark tests have been run both with our standard methodology, and with a completely full drive so that the tests measure performance of the QLC memory (with an SLC cache that is too small to entirely contain any of our tests). The two sets of scores thus represent the two extremes of performance that the Intel SSD 660p can deliver. The full-drive results in this review represent a worst-case scenario that will almost never be encountered by real-world usage, because our tests give the drive limited idle time to flush the SLC cache but in the real world consumer workloads almost always give SSDs far more idle time than they need. Intel's initial pricing for the 660p works out to just under 20¢/GB, putting it very close to the street prices of the cheapest current-generation TLC-based SSDs. 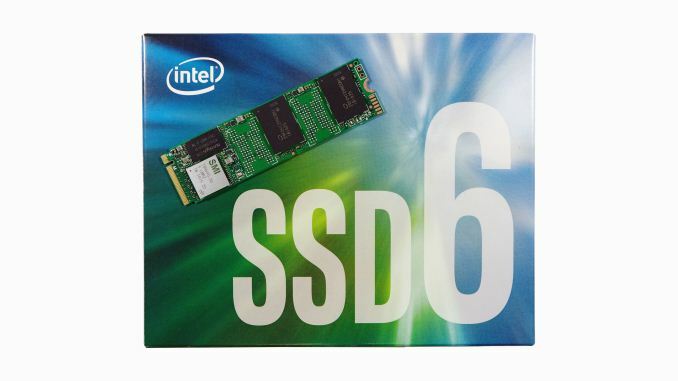 The Intel SSD 660p goes on sale today, and is being showcased by Intel at Flash Memory Summit this week. In traveling to FMS, I left behind a testbed full of drives running extra benchmarks for this review. When I can catch a break from all the news and activities at FMS, I will be adding to this review. The Intel SSD 660p is positioned as a very cheap entry-level NVMe SSD, so our primary focus is on comparing it against other low-end NVMe drives and against SATA drives. As usual, the Crucial MX500 serves as our representative of mainstream SATA SSDs thanks to its consistently good pricing and solid all-around performance. The other low-end NVMe SSDs in this review are the 660p's predecessor Intel SSD 600p, the Phison E8-based Kingston A1000 and and the Toshiba RC100 DRAMless NVMe SSD that uses the Host Memory Buffer feature. I'm sure you were the true prophetic one warning us about those crappy those 75GXPs before they were released, oh wait. Not bad, at least for now when there are no QLC competitors.